Running Press Kids, 9780762491841, 32pp. 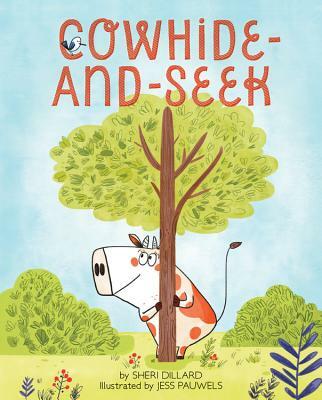 A fun and humorous picture book about a cow playing hide and seek, perfect for fans of Click, Clack, Moo. Where, oh where, could Bessie be? When Bessie hears the farmer counting his cows, she thinks he's starting a game of hide-and-seek. She hurries off to hide, determined to be the winner- but she's the only one playing! When her "hiding spot" walks away, she follows it . . . right off the farm! Ready or not, here comes the farmer! Will Bessie find the perfect place to hide? Sheri Dillard is a children's author and preschool teacher/librarian. She lives in Atlanta, GA, with her husband Mark, three sons, and a 100-pound puppy named Captain, who is not so good at hiding. Cowhide-and-Seek is her first book. Jess Pauwels grew up in a professional dancers' family but pencils were much more appealing to her. She studied arts and illustration at university and has illustrated a number of picture books and magazines. She lives in Brussels, Belgium.